Oh, and this shiny new FINISHER'S BELT BUCKLE!!! 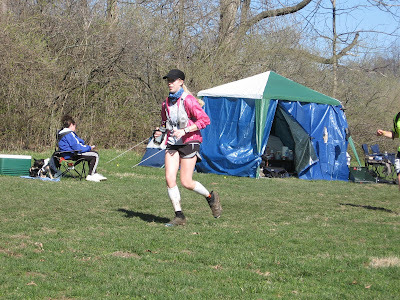 But seriously, I have a mud tan...you can tell I had on my Zensahs because that's the only still-pale area on my legs! Wow, McNaughton Park = done and done! I finished my first 50-miler and ya know what? I feel pretty freakin' great! Other than my knee pain making an encore post-race (which I expected), and a little residual soreness (also expected, although I thought it was going to be a hundred times worse than it is) I'm flyin' high. What an amazing experience, compounded by the fact that Andy Weinberg puts on one hell of a set of events and manages to make everything run incredibly smoothly for the runners, not to mention the volunteers were just OUT OF THIS WORLD awesome! Holy crap, you can't even "designer baby"-handpick the level of awesome that these volunteers were. Where do I begin? How about with some pictures! Hey, it's Ed!!! Coming in from another loop on Friday...number 2? Friday morning I picked Vermont Mike up at Midway and then we set off for Pekin around noon. Easy drive, no traffic = awesome. We picked up some food at the County Market and inhaled it in the car, then went straight to the Park to hang out for awhile and watch the 150'ers doing their thang, and to meet Andy, RD. It was a tad crisp when we got there, but the rain had stopped and the sun was battling with the clouds to come out, and it finally did a little later. We changed into some warmer clothes, grabbed the camping chairs and popped a squat by the start/finish line to watch the fun unfold. We met Jana (sp?) from Bloomington, who was also going to be running the 50M...super nice lady and we ran into her a few times on the course the next day. We also met Travis Liles who was there to conquer the 100M again; we got to run with him for a short bit on our second loop. What a great guy, and a tough one, too. Check out his Flatland Ultra videos, it has some great information on there for us ultrarunners! Wow, met so many people on Friday, so I'm really glad I got the day off and we were able to get down there early. After we tired of the cold, we made our way to the classiest joint in town, Super 8 Motel :) Then grabbed some dinner at Monical's Pizza. Yum. After unpacking and getting all our stuff together for the morning...pinning race numbers to vests, measuring out electrolyte drink into small baggies for easy carriage in our vests, putting post-race warm clothes into separate bags, putting together a drop bag, checking to make sure there were enough shoes, socks, first aid, sanity, etc....Mike zonked immediately, and I mean immediately snoring and out cold as soon as he hit his bed :) I, however, laid awake until 1 a.m. completely unable to fall asleep. Nervous energy, anticipation, excitement, the entire gamut of emotions were cycling through me a million miles a minute. To top it off, once I did doze off, I had my first "running through a building" dream where I was running the race through a building that I couldn't get out of. Very frustrating and it woke me up in a near-cold sweat. So I hardly slept that night; good thing I caught up on sleep earlier in the week leading up to that night! At 4 a.m., the alarm went off and we were up and at 'em. Grabbed a quick breakfast at Steak n' Shake (Mike ate like a horse, and I ate a bagel...nerves were really getting the best of me this time! ), and got to the Park around 5:15ish. We decided to set up Mike's tent and use that as our drop bag area since the actual drop bag tent was going to get pretty full once everyone else arrived. I'm SO GLAD we did this; it was so convenient and gave us a spot to change with some privacy, and keep our stuff out of the way and in one place. Headlamps: check. Hats and gloves: check. Timing chip: check. Atayne shirts and Pearls: check, check! Sanity and good nights sleep...wait, where did I put those?! "3-2-1 GO!!! Seconds before go time! See, pearls! This is the very first thing you encounter at the beginning of every single loop...mud soup! And it just got deeper and wetter throughout the day from all the feet pouncing through it. Oh, and it's kind of a steep downhill. But then you get to this wide open field where spectators and crew peeps hung out to cheer runners on as they came through. It was such a lift to hear Torey, of Chicago Ultrarunners, shout my name as I ran through the first time, thanks Torey!! After loop 2, Andy asked us how it was going and I told him I thought I had a blister so he immediately told me to see so-and-so to get it popped and taped! Thankfully, it was a false alarm. I have no idea what it was I felt, but there wasn't a blister in sight! I decided to change into shorts, my second pair of Cascadias, and into a dry pair of Drymax socks after slathering my feet in Vaseline. I'll go ahead and say that I am now 100% a Drymax fan. Fifty miles and not a single blister! I am so blister-prone it's not even funny. I can stand still and get a blister on the outside of my big toe. Wow, awesome product. Ooo, here's the big stream crossing, let's take a picture of Mike! I just wanted to pass out! Mike made sure everyone and their mother knew I just finished my first 50, so I got a ton of congratulations, hand-shakes, and high-fives, it was awesome. Have I mentioned how much I love ultras?? I ducked into our tent to change into clean, warm clothes before the "ultra shivers" could set in (I always get super, super cold right after an ultra, so if I don't get into warm clothes fast the shivers will not stop), then went right to the grill and ordered a juicy cheeseburger! Torey came over and congratulated me and we chatted some; she was going to be joining fellow Chicago Ultrarunner, and 100M runner, Adrian B. for a loop in the dark...go Torey!! Great way to learn how to night run...that's on my list :) After hanging around for an hour or so afterwards, Mike and I packed up the tent and our stuff, tossed it in my truck and went straight to the liquor store to get ice and beer! I needed an ice bath, stat. BEER! How often do you take an ice bath AND chill your beer at the same time? Well, I guess all there is left to say is that I had the most amazing experience for my first 50-miler. I wouldn't change anything about it. I had my secret doubts going into it because I had only run three times in the preceding four weeks due to my knee pain, so I was thinking I might have to call it a day before I could finish and just save myself for Pineland Farms. But the stars and planets aligned and the running gods decided that McNaughton was going to be my day afterall :) I am so freakin' happy and darn proud of myself! Your photos crack me up ... Pearls, 44 pounds of ice ... you're a breath of fresh air in the middle of a mudbath, Paige. Great race report and pictures, Paige! CONGRATS! Too bad you didn't get to run when the course REALLY sucked! Paige: GREAT report,loved it. Congrats on a great race and a great finish. It was good seeing you loop after loop. NASCAR laps have nothing on McN loops and my fan ticket was oh so much cheaper!! What a great report. I love your attitude; like others have said, "A breath of fresh air". I laughed out loud while reading this. Thanks for that. Congratulations on your huge accomplishment. I have no doubt that you'll do well at future races. Also, sorry, but a broken link, my blog is actually http://briangaines.blogspot.com. No harm. Jerry, I didn't know you had a blog! Ian, I am totally going to write Drymax; they are amazing. Paige, well done this weekend. It was good seeing you again in my moustacheless persona. Did you even realize it was me you were talking to on the road at LBL before the trails? I wound up running 'only 50' but chalked up some more experience, especially night running. I was on my own again and envy you for having friends with you. I must better organize the Kentucky runners. That water is most welcome during the daytime. I had so much fun running in it while the sun was out that I'd sing cadence! Wait, no way, that was you, Alan?? Boy was I way off! Yea, obviously didn't recognize you without the killer moustache :) Hahaha, my bad! And 50 is better than nothing, plus the night running is a really good thing to get experience in...I need to work on that :) I got lucky this race, having so many peeps around to cheer me on, as it's usually just me these days. I'm sure I'll see you again very soon! Thanks, Connie!! I almost fell out of my chair just now reading the end of your comment, lol. Hilarious! As someone who has a long background running road races, these trail races are becoming more and more appealing to me and you mention a lot of the reasons why in your report. Thanks again for the great read and pictures! It was awesome to 'meet you' in that field on your first loop. You looked strong and fresh the entire 50mi!! Would you mind if I download the river crossing pics and credit the photographer? I never got course pics and might be writing a blog post about this race. Great one, Paige! Congrats on the 50 miler!! Cool buckle and shirt. You might need some darker pearls to match the buckle though. Loved all the pics. Specially your shoes on Ian's pic. The mud looks tremendous. Excellent writeup. Thanks for sharing all the details. Torey, you can definitely download those if you want, no probs! Thanks for checking out my post! Paige, what an awesome race report. I really felt the energy and excitement as I read it. Thanks for the callouts too :) Though this was only my first concouring of the 100 course (or any 100 mile course), I DNF'd at 50 last year. Great job, you and Mike were a lot of fun to be around! Great job, Paige! McNaughton was my first 50M last year, and it really rocked this year--just enough mud to cushion the joints, but not so much to prevent us from running. I really enjoyed your report. Glad you finished and had such a great time! Great job on your first 50 miler,Paige!! Keep up the good work and get ready for the "big dance"... your first 100 miler! Thank you Stan and Adrian, you all rock :) Oy, the "big dance"...I can already feel that itching in my bones, telling me to go longer, yikes! Congrats to you, Adrian, on a great hundred performance! Congrats Paige! Once again another incredible race report. Everyone at camp Atayne is proud of their favorite pearl wearing ultra runner. Woo hooo!!!! Way to go, Paige. And fantastic report. I feel so happy for you!!! I’m so impressed that you handled the distance & course so easily! Thanks for the encouragement at the finish area – that really helped. 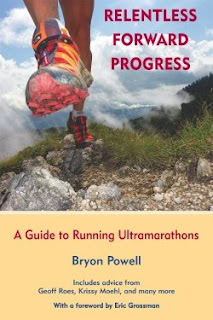 I look forward to seeing you at future trail ultras! Congrats on finishing your 1st 50 miler. McNaughton is a tough one to do so it is great accomplishment. The RD does put on a great race. Rest up and show off your "buckle"
Congrats on your first fifty!!! Awesome race report as well! Congratulations on your first 50-miler, especially with such little training in the last weeks. Funny write-up, enjoy your attitude, and love your header picture. Wanted to know if I could have your permission to use 3 of your photos in my write-up, since I didn't feel like schlepping my camera with me (if I don't hear from you in a day or two, I'll just go ahead, credit always given). Thanks! Heya Mark, I'm glad you enjoyed! You can certainly use some of my pics :) Thanks for reading!